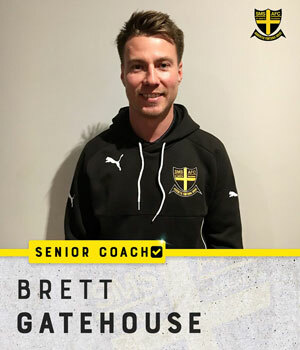 Following a rigorous and extensive coaching selection process Brett Gatehouse​ has been appointed Senior Coach of the club for the next two seasons. As a player, Brett joined St Mary’s AFC in 2007 (before our amalgamation with Salesian Old Boys) and was a part of our rise from Division 4 to Division 1. Having played well over 100 games, he is our longest serving club captain, leading the club from 2012 to 2016. 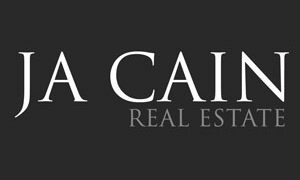 He has a wealth of playing experiences, as he has also been involved at Old Trinity Grammarians (VAFA Premier A), Cairns Saints (Cairns Football League) and Thorpdale Football Netball Club (Mid Gippsland Football League). In 2016, he was the Under 17’s Division 1 Colts at Ashy Redbacks​. In 2017, he joined Thorpdale Football Netball Club, as a midfield coach and in 2018 he was elevated to a Senior Assistant playing coach. On behalf of everyone at our club, we welcome Brett and his fiancé Jennifer back to the Saints for 2019. We are pleased to announce that Ant Murphy has been reappointed Senior Assistant coach for the 2019. 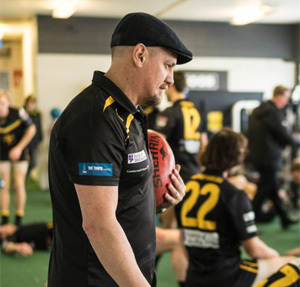 After retiring as a St Mary’s Salesian premiership captain, Murph naturally transitioned into coaching, beginning his coaching career in 2016, being co-coach of the 2016 Reserves Premiership side. In 2017, he once again took the Reserves team to the grand finals. This year, he served as the Assistant coach to Senior coach Erwin Leyden. We are excited that our 2014 and 2015 Reserves and Seniors captains are paired together in 2019. 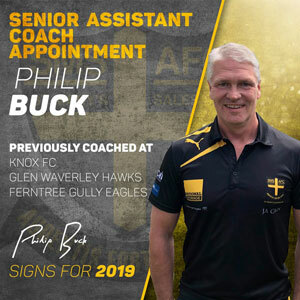 We are proud to announce that Philip Buck has been appointed as our final member to our Senior Men’s Coaching team for 2019. Phil will be an assistant coach to Brett Gatehouse and will be the forward line coach for the senior team, a position he held at Knox Football Club during their 2017 EFL Division 2 premiership season. 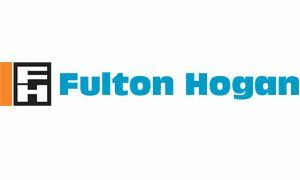 He will enhance the club’s strategic analysis, to ensure that all players can develop their skills and competencies to maximise their potential. Phil has a genuine passion for mentoring and developing players, ensuring that players at the club thoroughly enjoy playing the game. Before his involvement at Knox FC, he was a Senior Assistant coach at Glen Waverly Hawks for two seasons. 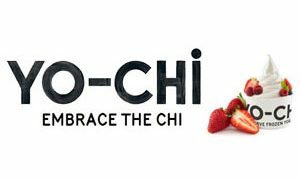 Concurrently with these roles, he was the coach of his son’s junior football teams at Ferntree Gully Eagles Football Club and St Simons Community Football Club. 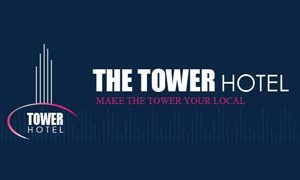 He previously played football at Pakenham Football Club and Dandenong Football Club. 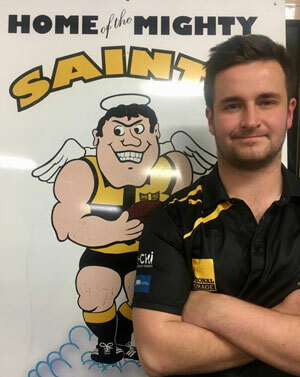 On behalf of everyone at our club, we welcome Phil, his wife, Megan, and his two sons, James and Josh to the Saints for 2019. We are pleased to announce that Reserves coach Scott Gatehouse will be at the helm again for season 2019. Scott played over a 100 games for the Sainters and was a part of the 2014 Reserves Premiership side. After playing a season for Thorpdale in the Mid Gippsland Football League Scott returned to SMS to take up the position as Reserves coach. 2018 rapidly developed our Reserves side as they played in a fiercely competitive competition. 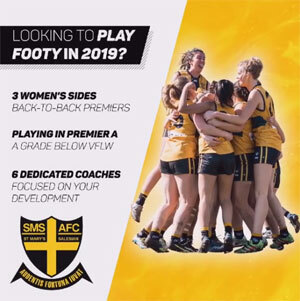 Scott’s development and execution of a new game plan and the blooding of new players will hold us in very good stead for season 2019. We are pleased to announce that Jack Byrnes has recommitted to be the Thirds coach in 2019. 2018 was Jack’s debut season as a coach, and we couldn’t be prouder of his performance. Jack led a recommitted Thirds side who fought gallantly in a highly competitive grade in the Thirds competition. Even though the Three’s were playing in a higher grade in 2018 than 2017, Jack oversaw a marked improvement in performance, with season highlights including two wins against rivals PEGS.In the 2017 season Jack served the team as a playing assistant coach, and in 2014 he was a part of the Under 19’s Leadership team. 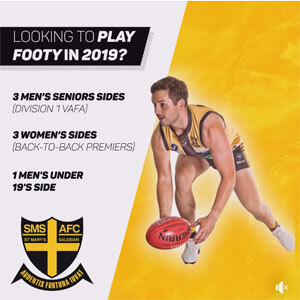 2019 will be Jack’s seventh year at the club, and he will put his 66 game SMS career on hiatus to take up the coaching whiteboard (even though he did put on the boots for one game in 2018). The Third’s will be a competitive unit once again in 2019, as they will be re-graded into a lower division. Erwin was our senior coach for 2012-2013 and then again 2017-2018, taking the club to the 2017 Division 1 Grand Final. Between 2015 and 2017 Erwin served as an assistant coach to Jess Sinclair. When Erwin first arrived at the club we were cellar-dwellers in Division 2 and due to some good fortune we just avoided relegation. In 12 months he turned around the list and we made a preliminary final. He was able to achieve such a turn around due to his genuine care for all players on our list. Taking an active involvement with each individual player, to ensure that they can play at the best of their abilities. Since his involvement in the club we have won a Under 19’s flag, 2 Reserves flags and 2 Women’s flags. He truly has been a coach that the players play for. On behalf of the players, the committee and supporters, we would like to thank Erwin for his outstanding contribution to the development of our club and the senior team. Erwin has become a true St Marys Salesian person, and we look forward to seeing him at matches in 2019 as a club supporter and at the experts table on Thursday nights.